We design and handcraft unique, functional art out of concrete utilizing environmentally friendly mixes. We create furniture, vanity sinks, countertops, fireplace surrounds, water features, wall panels, floor tiles, sculptures, and any other objects that you can imagine. For concrete, the potential for design is endless. Our ability to combine form and function can turn a boring element like your kitchen counter, or restroom vanity into the focal point of a room. I find that I draw heavily from the design principles of Wabi-sabi, which celebrate asymmetry, asperity, simplicity, modesty, and appreciation for the integrity of natural objects and processes. I am fascinated by objects that reveal themselves through their imperfections. Typically concrete is a banal building material that is cold, hard, and unyielding. I have found that by manipulating its form, I can soften the hardness introduce a sense of humanity. I love how it can contrast it’s smooth hard character with the earthy textures of nature, or the stark coldness of steel, to create visual interest. 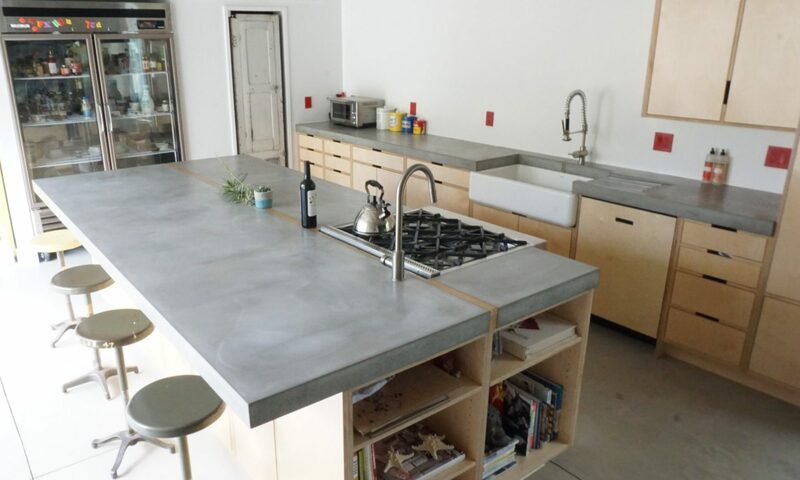 Concrete derives its character from how it flows through and cures in its mold. It’s these unforeseen results of the artistic process that intrigue me, and when I am about to remove a freshly cast piece from its mold I feel a sense of anticipation. How will the mottling turn out? What will the character of this piece be? It’s this character that differentiates concrete from so many other materials that simply produce a uniform appearance. In this way perhaps, concrete might transcend its status as an inert building material . . . a sidewalk . . . a wall . . . to become an object of beauty and attention . . . the centerpiece of a room. While traditional concrete creates a large carbon footprint, we use a variety of engineered mixes that contain various amounts of post consumer and post industrial recycled content. These ingredients also have the added benefit of actually helping to produce better concrete. In addition, most of our ingredients are produced nearby, and the sealer that we use for most projects produces nearly zero VOC’s (volatile organic compounds). We try to do our part to leave as small a footprint as possible. We re-use items whenever we can; we recycle all of our unused concrete; our shipping materials are recycled or re-used; we have eliminated wet grinding from most of our processes to save water, and we know that working green doesn’t mean we have to compromise the quality or artistry of our products. While we acknowledge that there is no totally harmless, perfectly “green” material. Every act of human production drains the earth in some way. We have taken many steps to make our product a less harmful option than the alternatives.